How clean does oil need to be? What is the benefit of clean and dry oil? How long will my oil last? How is RULER different to other tests? 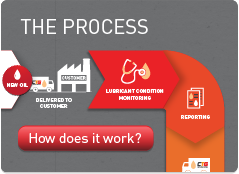 What is a lubricants particle count? If you want extremely low wear rates and long equipment life the evidence indicates that oil needs to be filtered down to sub 5 micron size and preferably down to one micron size. Clean, dry oil can extend equipment life between failure up to 8 – 10 times the normal operating life. Most lubricants are used in oxidative environments and require changing before the additives are fully consumed. If the oil is not changed on time, harmful acidic by-products, sludge and deposits will be generated to pollute the system. To know how much longer your oil will last, CTG measure the antioxidants for you with RULER. When the antioxidants are at 30% Remaining Useful Life (RUL), it is time to renew the oil. This way you can maximize the life of the oil without risking equipment reliability. Ruler™ (Remaining Useful Life Evaluation Routine) Instrument (ASTM D 6810) is a technique to measure the antioxidant levels in lubricants. Comparisons of results with those from new lubricants provide a quantitative method of determining the remaining antioxidants or useful life of lubricants. Excessive temperatures, water and/or cleanliness levels of the fluid have a direct relationship to the reduction of antioxidants. RULER allows remaining percentage of lubricant additive to be trended and predict a lubricants remaining useful life. Many conventional laboratory techniques such as kinematic viscosity, total acid number (TAN), infrared (IR) data, and wear metal analysis are used for measuring the extent of oil degradation after it has occurred. These techniques only begin to show significant changes in the physical and chemical properties of the oils when a majority of the antioxidants have been depleted and the oil has begun to substantially degrade, approaching the end of its useful life. RULER therefore allows measurement of how good the oil still is, NOT how bad the oil has become, after the damage is already done. Emulsified water is water that has been mixed, homogenised and/or mechanically emulsified in the lube oil to form extremely strong emulsions, strong in the sense that gravity or other devices will not work in separating the two phases. Emulsified water is capable of reducing lubricity. Free water is free to separate and settle to the base of the reservoir. Free water is the most damaging, because it can displace Lube oil and allow metal to metal contact of moving surfaces. Free water in hydraulic and lube systems leads to bearing fatigue, accelerated abrasive wear, corrosion of metal surfaces, increased electrical conductivity, viscosity variance, loss of lubrication and additive breakdown. Free water occurs when lubricant becomes saturated and cannot dissolve any additional moisture. The moisture can make the oil appear cloudy and can even be seen in the base of a storage reservoir. Dissolved water contamination is the least harmful of the three types of water. Dissolved water is a function of the environment; Relative humidity, temperature, and oil type will normally determine what dissolved water content will be. The micrometre is the standard for measuring particulate contaminants in lubricant. Oxidation is a chemical process where oxygen converts hydrocarbon molecules into different products, such as carboxylic acids. Lubricant anti-oxidant additives counteract oxidation, but are consumed in the process. The rate of oxidation doubles for every 10°C rise in temperature above 100°C. In addition, heat, water contamination and dirt contamination will speed up the oxidation rate in lubricants. The particle count results reflect the solid contaminants present in lubricant and are applied to assess cleanliness. Levels of cleanliness are represented by the ISO 4406 classification system to classify the particles larger than 4‐μm, 6‐μm and 14‐μm per millilitre of fluid (for example: 18/16/14).